Can Skylake save Intel from the iPad Pro? Tablets may be going the way of the dodo bird, at least that's what Intel wants you to believe. With the release of Intel's sixth generation Skylake processors this autumn, Intel is hoping that the new chips will drive consumers to choose two-in-one convertibles over tablets. Combined with partner Microsoft's launch of the Windows 10 operating system, Intel CEO Brian Krzanich told investors at the company's annual investor meeting that "there's not a reason you have to go to a tablet device." Krzanich appears confident that the power, performance and versatility that Skylake delivers with Windows 10 will make it an easy choice for consumers. Even though Apple's iPad tablet remains a market leader, sales have declined. 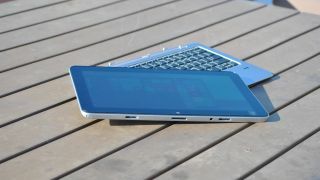 With growing demand for convertibles, Intel predicts that it will ship fewer processors for tablets. Last year, its chips were found on 40 million tablets. This year, the number may be closer to 30 million. Intel isn't the only one bullish on the convertible form factor. This summer, analysts from Gartner, IDC and Canalys predicted that even though tablet sales may be slowing down, there is a bright spot for growth with the two-in-one category. Even Microsoft's Surface Book, which the company claims to be the best laptop ever made ounce for ounce, comes with a detachable screen that transforms it into a lightweight tablet in Clipboard mode. There are several hypotheses on why the two-in-one category is gaining momentum. First. Skylake will deliver more computing power while still being energy efficient for this mobile form factor. Second, tablet users may realize that this form factor, while great for consuming content, isn't quite suited for content production. And lastly, businesses may find this form factor appealing as they look to upgrade existing notebooks. Microsoft built in better support for convertibles into its Windows 10 operating system with a feature called Continuum, allowing users to adjust the user experience of the OS based on how they use the device. The growth of convertibles may be a bright spot for Intel as it continues to struggle against ARM with its mobile strategy. Unlike the desktop market, Intel's chipsets are only found in a limited number of smartphones and tablets. If Intel's prediction is correct, the shrinking tablet market and growing convertible market will help Intel reclaim mobile owners who may have previously chosen a tablet powered by ARM.